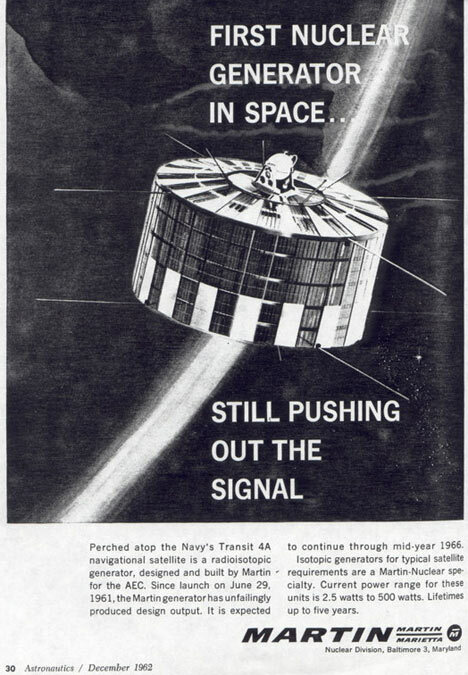 Transit 4A, launched June 29, 1961, was the first satellite to use a radioactive power source (a SNAP-3). Transit 4B (1961) also had a SNAP-3 RTG. Transit 4B was among several satellites which were inadvertently damaged or destroyed in a nuclear explosion, specifically the United States Starfish Prime high-altitude nuclear test on July 9, 1962 and subsequent radiation belt. Astronautics, December 1962. April 1, 2016 Old Westbury, New York - A report in 2011 by the U.S. National Research Council warned NASA that the amount of orbiting space debris is at a critical level. According to some computer models, the amount of space debris “has reached a tipping point, with enough currently in orbit to continually collide and create even more debris, raising the risk of spacecraft failures.” The report called for international regulations to limit debris that is now in the thousands of pieces and figure out a way to get rid of it. Previous PostPrevious Would Wolves Kill 19 Elk in Wyoming One Night and Not Eat Them?